So let’s do that. We will expand the scope of the question to include the Millennium Falcon, a Star Destroyer, and the Enterprise. Ah, but which Enterprise? Since we’ve given Star Wars a bit of a handicap, let’s even tout and include both major iterations of the famous Star Trek flagship: Kirk’s original NCC-1701 from the series, and Jean-Luc Picard’s 24th century NCC-1701-D. Some low-key math is necessary to weigh these numbers on an equal playing field. The Falcon has a top atmospheric speed of 1,050 kilometers per hour. Since a Star Destroyer isn’t typically flown in atmospheric conditions, we can safely assume its top-speed of 975 kph means the Falcon’s maximum sublight in space is about the same as it gets planet-side. In Star Trek, 100% output of sublight engines is referred to as “full-impulse,” implying these ships rely on the same type of ion impulse drives as in Star Wars. Full impulse for Voyager was just about one-fourth the speed of light, or about 270 Mkph. That’s “million.” The Enterprise, being older, is probably slightly below this benchmark. Herein lies the first problem for the galaxy far, far away: Star Trek understands how overwhelming large empty space is. Star Wars mostly takes place on or immediately surrounding planets. Speed isn’t much of a variable, except in dogfights. Like naval battles, maneuverability and power are more important than overall speed. Traversing the galaxy is another matter. In this realm, beating one’s opponent to a location can make the difference between losing a shuttle race and losing Han Solo to the bounty hunter Boba Fett. In Star Trek, “warp” factor has been adjusted several times to compensate for developing technologies, but ultimately remain both a tool of the writers and completely arbitrary in-universe. The simple version of the explanation is that the dilithium antimatter reactor powers a “warp core” that creates a protective bubble several meters out around the entirety of the ship. Space immediately ahead of a ship is then compressed while space behind it is stretched out. Thus, warp factor isn’t so much a “speed” as it is a quantification of the compression factor. 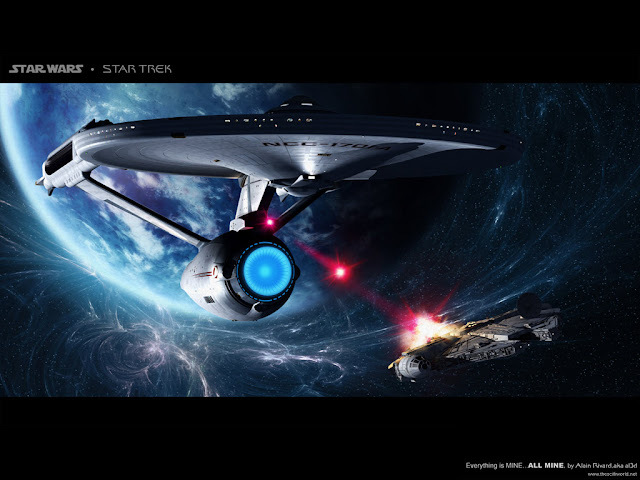 Many technologies can move ships and other objects from place to place in less time than warp, including “transwarp,” wormholes, and the delightfully disregarded “Warp 10” which is equivalent to “infinite velocity” and causes the traveler to be everywhere at once and simply ‘choose’ where to get off. All that said, “Warp 1” almost exclusively translates to the speed of light, or roughly 186,281.8 miles per hour. Using The Next Generation’s slightly more consistent measurements of relative speed, Warp 6 for Kirk’s Enterprise would be between 200 and 300 times the speed of light, while Picard’s Enterprise tops out at a hearty 1,000 times C.
Star Wars takes a much more whimsical approach to superluminal travel, denoting higher speeds with lower integral and fractional numbers. “Hyperspace” is roughly akin to Star Trek’s transwarp: a hyperdrive shifts the vessel into and out of another dimension, wherein distance is functionally scaled such that a day’s travel could place one across the galaxy. The Millennium Falcon has a backup Class 10 hyperdrive, denoting it as very slow. It’s primary hyperdrive however is a highly modified Class 0.5. As a point of reference, Class 0.0 would be equal to Warp 10’s “infinite velocity” in Star Trek. Han Solo’s “Point-five past lightspeed” then would edge out the Enterprise-D in a cross-galaxy trip at Warp 9.2, though if Geordi pushed the engines into the red he could eek out the Falcon be ramping up to Warp 9.8 in a sprint. Both leave a Star Destroyer in the cosmic dust. Shields are actually kind of level already. The Enterprise utilizes a deflector shield which is basically a highly energized layer of frequency-controlled gravitons, distorting the space around the ship and protecting it both from external attack and high-energy interstellar particles, drawing its power directly from the ship’s antimatter reactor. The Falcon meanwhile sports a small concussion field generator to both deflect physical attacks (“partial shields”) and compensate for acceleration at sublight velocities, as well as deflector “ray” shields to absorb energy-based attacks and radiation. The power for this also comes directly from the power core, so lets compare the two head on. If shields have the same function and relative utility, then the issue becomes strength and duration. Part of that can be determined by their power source. Star Trek likes to make frequent mention of their dilithium crystals, a fancifully energetic matter-antimatter reaction. The Millennium Falcon actually only has a fusion-based power core for normal function. Typically, a fusion reaction is going to produce less energy than a matter-antimatter reaction, pound for pound, however efficiency is never really discussed in either universe and Star Trek prefers to employ “techno-babble” nonsense terms to obscure energy output, while Star Wars tends to simply omit references. 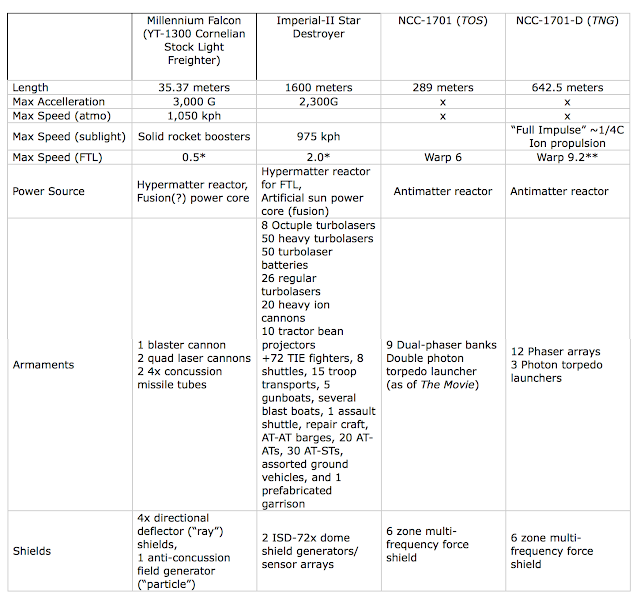 “Tends.” An Imperial-II class Star Destroyer has a fusion core nicknamed the “artificial sun,” implying great power but strangely specific in that its output is measured at precisely 9.28x10^24 watts. So there’s one hard number we can latch onto. The other side of the coin is offensive weapons. Shield strength may be powered with different batteries, but it is measured in how much it can take. Star Wars takes a lot of heat for its use of “lasers,” however only the Death Star’s “superlaser” is technically a laser. All other weapons in Star Wars are actually “blasters,” which fire an accelerated bolt of highly-charged plasma, traditionally Tibanna gas. “Turbolasers,” sadly, suffer from and perpetuate this mistaken belief. Phasers, meanwhile, fire a laser-like beam of artificial “nadion” particles, capable of “liberating atomic nuclei.” Essentially, it’s a particle beam that reduces anything it hits to a charged plasma. The efficiency of this reaction can be controlled, to achieve anything from a mild heating to surgical cauterizing, to disintegration. Fundamentally, blasters are actually more grounded in reality, giving Star Wars the science award for once. Torpedoes are another matter entirely. While the Enterprises are equipped with photon torpedoes, warp-capable matter-antimatter explosives of variable strength, the Millennium Falcon is only outfitted with military grade concussion missiles, capable of breaching ray shields but not doing much against particle shields. A more direct comparison would be the “proton torpedoes” utilized for Rebel Alliance X-Wings against the Death Star in the Battle of Yavin. These were also matter-antimatter bombs, of roughly comparable dimensions and explosive force. Adam Savage is still right, but the victory isn’t as obvious as he assumed. While the Enterprise, either one really, sports greater power output for shields and weapons and is mind-numbingly faster, the Falcon could jump to Earth from the Delta quadrant in just three or four days. Which is kind of always what Han boasted, after all. He may not be able to disable a “bulk cruiser,” but he can certainly outrun them. The NCC-1701-D could maybe keep up for about 4 hours before its systems overloaded and she had to drop out of warp, but the original ’01 isn’t even in the running. Any fight between the two would require Han to pull some fancy fly-on-the-wall maneuvers or otherwise try to drop a prepackaged, precisely timed payload of proton torpedoes before Jean-Luc disintegrates him out of sheer boredom. A Star Destroyer might actually put up a solid fight against Captain Picard, though. While it would be almost sedentary by comparison, an Imperial-II is more than five times the size of Kirk’s Enterprise, and 2.6 times the size of Picard’s. It’s power core is functionally a dwarf star, and its physical armaments either match or outclass Starfleet’s best across the board. It carries a squadron of fighters and an entire garrison for Force’s sake. The Enterprise could run a thousand laps around a Destroyer, but nothing short of a full complement of photon torpedoes is going to put a dent in it. As with the Falcon, the Enterprise’s only hope would be escape. This is somewhat complicated by the fact that in this instance both vessels are in possession of tractor beams. If the Destroyer managed to ‘harpoon’ an Enterprise and keep it in weapons range, it could simply wait out the smaller vessel’s crew, weapons, or power reserves by pouring barrage after barrage of turbolaser and ion cannon fire into it. I never actually disagreed with Adam. I disagreed with his methods. Similar to downloading different quality DVD/Blu-Ray rips of The Wrath of Khan. It also makes you hyper-evolve into a lizard and mate with your captain. It also has a ‘hyper matter’ reactor, but only for initiating functions related to hyperspace travel. Yes, the kind Lando mined on Bespin! Neither blasters nor phasers actually shoot out into space indefinitely, as both emit charged particles that would very quickly cool to nothingness due to the entropic coldness of open space. This explains why everyone always needs to be “in range” to fire weapons. Interdictor Class Star Destroyers, a variation of the Imperial line, contain gravity well generators capable of inhibiting hyperspace travel by creating a “mass shadow” as strong as that of an actual planet. While it would certainly not be advisable to take a ship to warp within range of an inhabited planet, theoretically any ship in Star Trek could go to warp so long as their warp bubble itself was beyond a planet’s upper atmosphere. It is unclear if there would be any damaging affects to either ship if one were to attempt warp travel in open space from within an interdiction field.